First Surgery (2011) A depiction of what I was like when I was in ICU recovering from that first surgery. My intestine was coming out of my body (I had an ileostomy), along with 5 or 6 tubes. 35 years and 1 week ago today I had my entire colon (large intestine) removed (known as a “colectomy”). I was 11 years old. 6 years earlier I had been diagnosed with Ulcerative Colitis.It was the first of what would be 6 surgeries. I had one each at age 11, 12, 13, 14, 17, and 21. When I had that first operation, part of what we were expecting was that I would be cured. That was the language and thinking used by the medical community and the CCFA (Crohn’s and Colitis Foundation of America), one of the primary funders of research for Inflammatory Bowel Disease (IBD, which includes both Ulcerative Colitis and Crohn’s Disease). The idea is that you if you take out the colon, you can’t have Ulcerative Colitis. This didn’t work out for me, though, because when I was 20, I was re-diagnosed with Crohn’s Disease. Even if it did work out I think the word “cure” used in the context of removing your entire colon which alters your life permanently in big and small ways is misleading to patients and their families. To their credit, some, including the CCFA, have stopped calling colectomies cures. Anyway, when they told me I had Crohn’s, it meant that I was not cured and I thought I was going to have to go through all the horrible things I went through in the first 20 years of my life again and I just really didn’t think I could. So far, it’s turned out that I had one more surgery at age 21 and haven’t had to have one since. I do have number 7 coming up but not for Crohn’s, for a torn rotator cuff. One fear I have about it is that I will get sick again as I did before my last surgery. I was so terrified of having another surgery that I think I stressed myself into sickness because I took a major downturn that began when we finalized the date and ended with the removal of more of my small intestine (some had previously been removed in other surgeries). 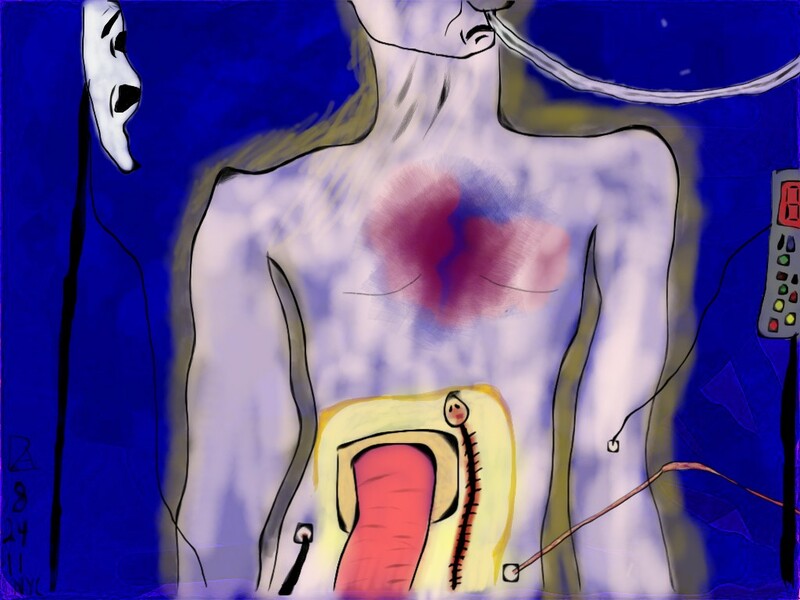 This entry was posted in Art, Biographical, Crohn's/Ulcerative Colitis, Featured, Health, Inspiring, iPad Art, Writing.